No, no, no…not those kinds of babies. We’re talking babies of the feline variety here…triplets to be exact. From now on, just call us the crazy cat people. I’m pretty sure getting three kittens qualifies you for that classification. Last weekend we had an appointment to take our pup to the vet for some shots. They sometimes have kittens for adoption in the lobby and before we walked in Andy said, “If they have a calico for adoption, she’s coming home with us.” Well, you can see that they did indeed have a calico and there was no way we could break this precious little bunch up. Having lost both of our 18-year-old cats earlier this year, I didn’t think I was quite ready for this step. But all I had to do was watch Andy watching these guys play to know that we made the right decision. It’s obvious how happy it makes him to have this kind of energy back in the house. In fact, it’s downright adorable to see the look in his eye when he holds one of them. In his words, it makes his heart feel full. That’s quite a return on investment. So, needless to say, things have been a bit hectic this week and I haven’t had a whole lot of time for much besides kittens, kittens and more kittens. However, as you know by now, there is always time for a cocktail around here, and with the Fourth of July coming up, it’s a perfect excuse for this festive beverage. Puree watermelon, vodka and juice of one lemon wedge in a blender. Add ice (to desired thickness) and blend until smooth. If sugaring the rim, pour a small amount of blue decorating sugar onto a plate. Run lemon wedge around the rim of the glass. Dip rim in sugar. This is a simple, refreshing drink that is a bit more fruit juice than cocktail, but it hits the spot on a hot day. 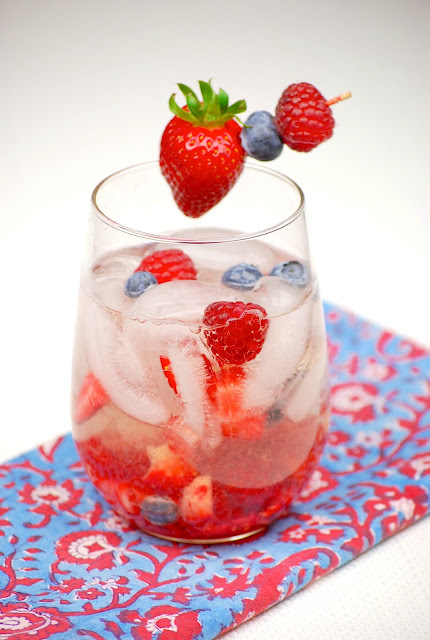 And if you’re looking for another patriotic beverage, White Wine-Berry Sangria always hits the spot...Happy Fourth of July! Congratulations on the new family members! If Hubby would allow it, I'd be crazy cat lady. As it is, we have one (and she's parked on my desk as I type). I'm sorry that you lost the two earlier this year; it made my heart hurt for a moment to read that but these new babies will definitely help fill that void. Anyhow, to the drink! I've not seen blueberry vodka yet but will be on the hunt for it later today. 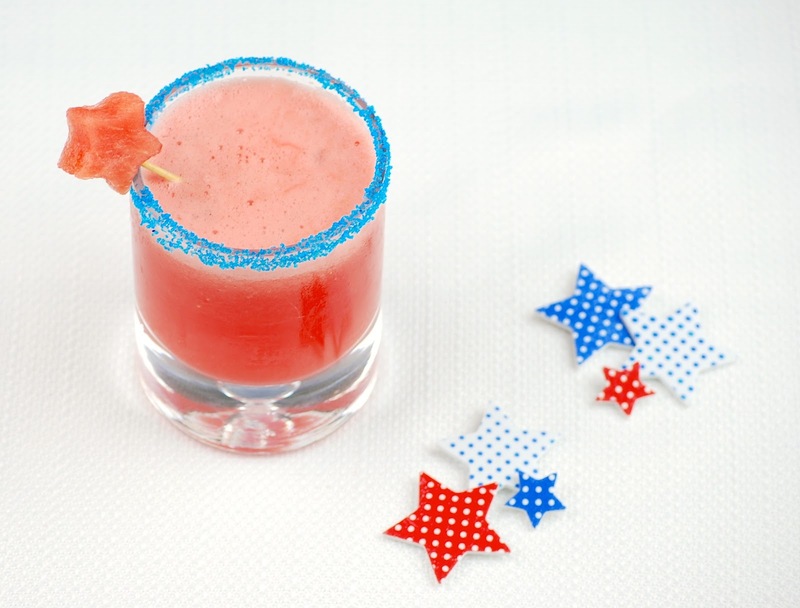 Your cocktail looks amazing and is the perfect way to celebrate the 4th! Congrats on the newest additions! Congrats! And the cocktail looks amazing! PS...both cocktails look so festive and delish! Congrats on your new kittens! They are so cute!! Love the cocktail, too. 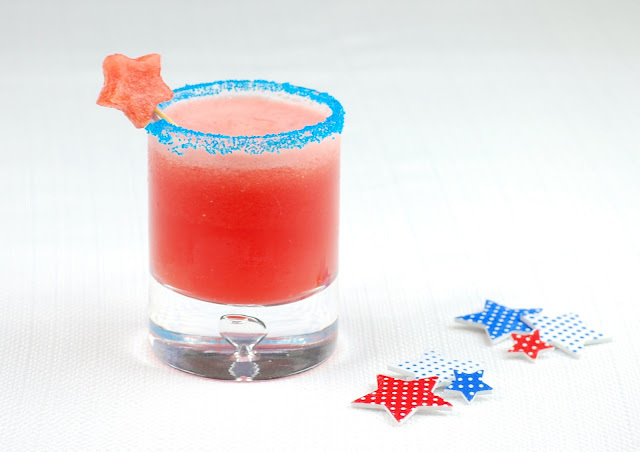 The watermelon star garnish is a great touch. Happy 4th of July! blueberry vodka is making me go weak in the knees! Congratulations on your kittens!! They look adorable! What a pretty drink and light with only 1 oz. of vodka. The fact that you used blueberry vodka is interesting. I've never tried it but it sounds great. Congrats on the new additions. We've had cats, now we just have one young, playful dog but I think once you get used to living with pets, you really can't do without. Happy 4th! What a nice looking drink! And what cute kittens. What a great idea for the 4th. Love your tri-tips below too and both would make for a fun grill party. Gorgeous drink! You have another feature on our Facebook page: http://www.facebook.com/RecipeNewZ :-) Happy 4th of July! Very patriotic colors! Happy Independence Day and congratulations on making the foodbuzz Top 9! What a great recipe for the 4th! Looks so refreshing and delicious. Yum! Aww they are such cuties! I'm glad you embrace being the crazy cat people :) I hope to be the crazy dog lady one day. 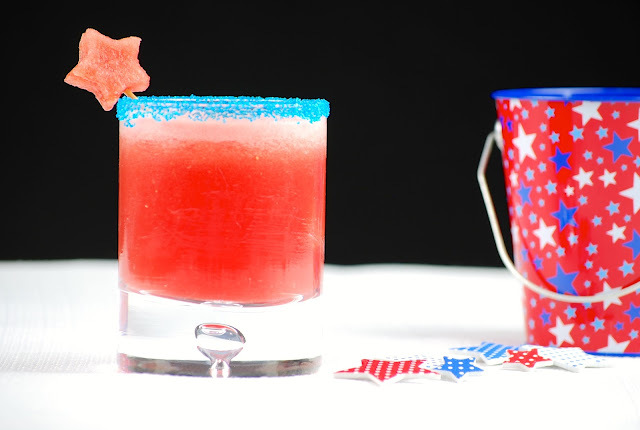 Love this festive (and gorgeous) cocktail! 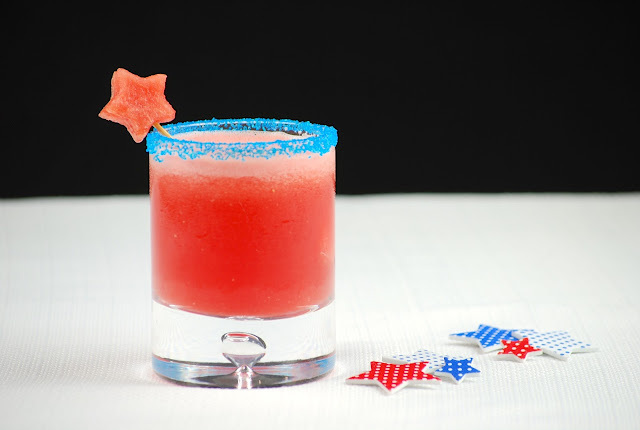 I had this crazy idea that cocktail bars in london would offer this beverage to american expats for 4th of july, just for the kicks of the holiday. مكافحة النمل هي تخصص شركة مكافحة النمل الأبيض بالمدينة المنورة بجميع أنواعه مثل النمل المنزلي و النمل الأبيض و جميع أنواع النمل و بأفضل أنواع مبيدات الصحة العامة المستخدم لمكافحة النمل فنحن الأفضل لمكافحة الحشرات والنمل بدون مغادرة المكان و بدون مواد سامة و بدون مغادرة المكان لذا يجب الاستعانة بنا فالحشرات من أكثر الأحياء ضرره و هى تتخذ مقامها فى مختلف أنواع المناخيات و هناك أسباب عديدة تكمن وراء قدرة الحشرات على البقاء والانتشار فبعض الحشرات تستطيع الطيران مما يسمح لها أن تنجو بسهولة من أعدائها و لمعظم الحشرات هيكل خارجي خفيف و قوى يحمى أجسامها فلا تتردد بالاتصال بنا.